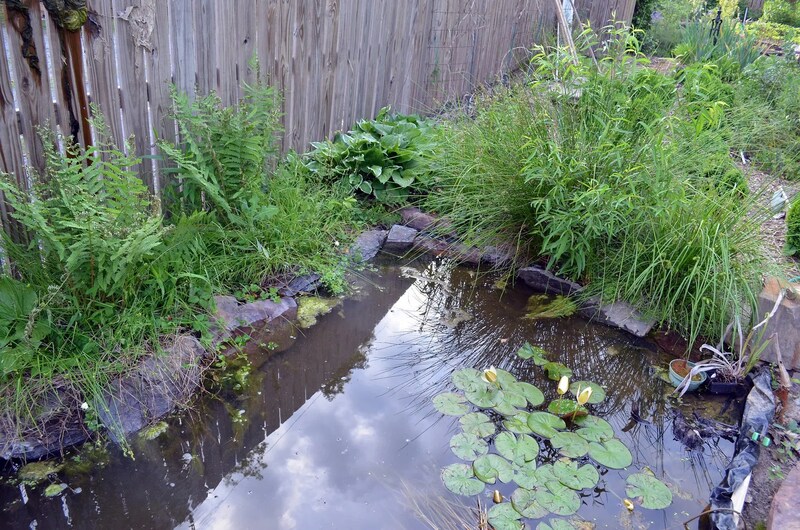 Our little pond has certainly aged well over its first year; the “borrowed” bog bottom sod over my purposely soggy beds bordering the pond seems to be right for what we were seeking. 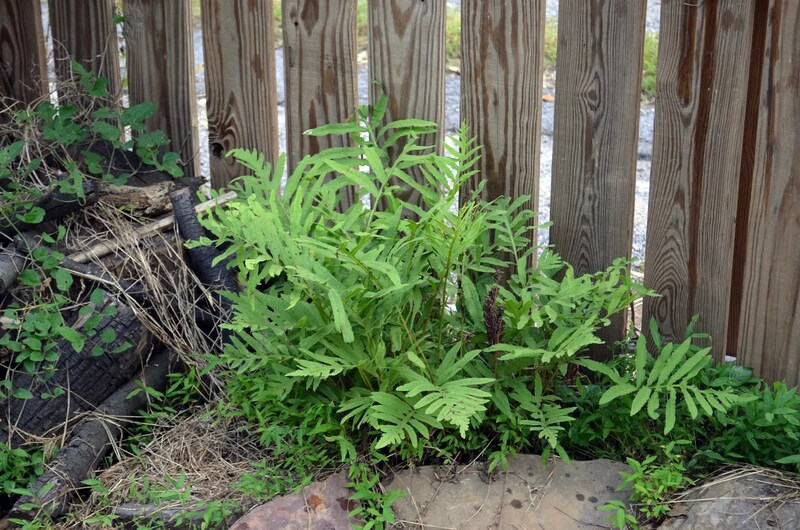 Ferns have come back despite the abundance of warm sun the spot provides them…. The interesting “grass” sphere that became so prominent last year is as pretty as ever and additional similar clumps are developing. 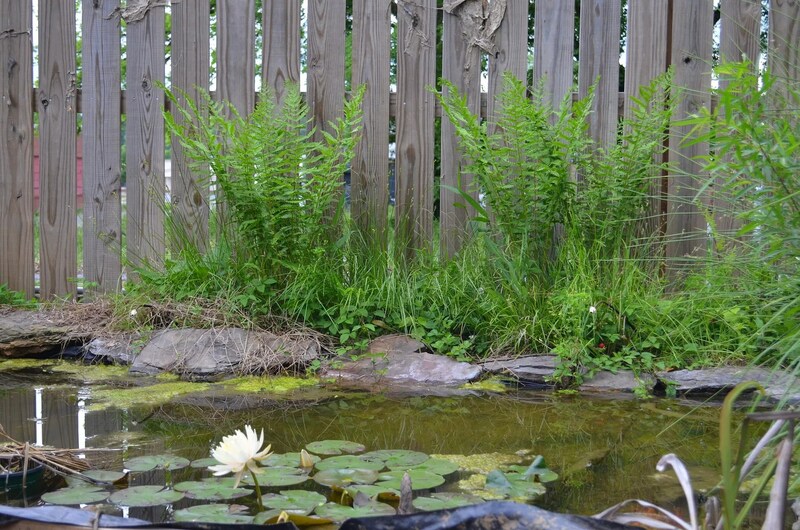 The “garden side” of the pond settled and ended up being slightly lower than the “fence side” where the soggy beds are. This meant that the automatic topping off of the pond didn’t keep the beds as wet as it could have since the water seeped over the other (garden) edge and not into the beds. I’ve adjusted this (with an ugly temporary fix) and it seems to be flowing correctly again. Unfortunately, the beautiful ferns that doing so well got “burned” on their tips as they were coming out; they may still do OK but it was a disappointment regardless. 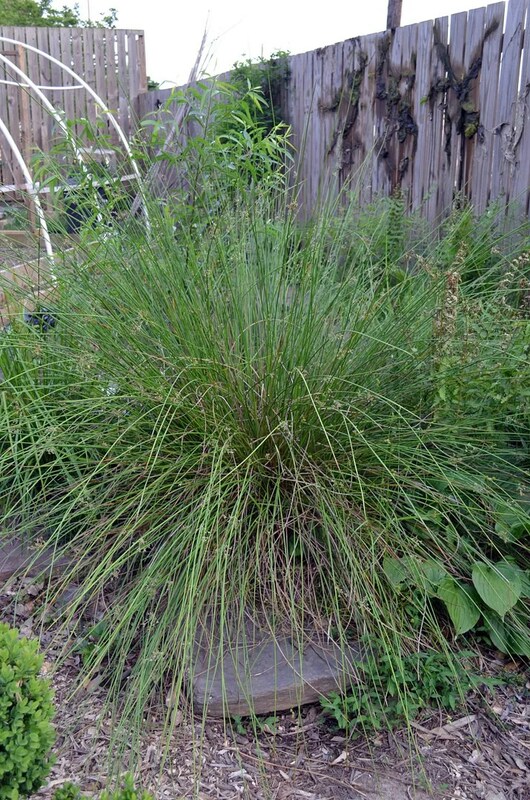 The really bad news is I spent the time to identify the “grass” that is doing so well….. it is actually sedge, which is a cousin to the nutsedge aka “nut grass” that is impossible to eradicate from my lawn and parts of my garden beds. It came with the mountain bog sod, so I sent some pictures to my sis who conveniently lives in the mountains and has plenty of boggy ground around her home. 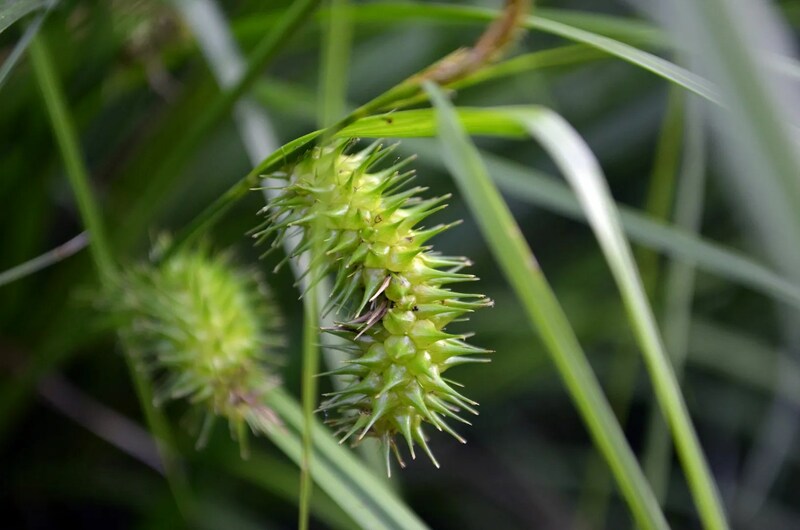 She immediately ID’d one of the sedges as an invasive nuisance and advised removing it immediately. I have started, but the roots of the main clump are connected to the building foundations in Bejing and it is going to take some work. 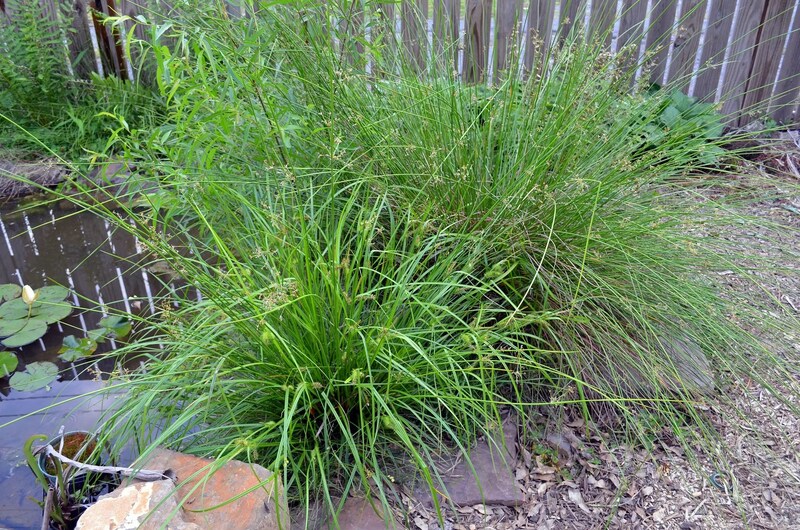 From 90 degrees, the same sedge with the new questionable one in the foreground. The southern end with ferns from my sis and the pile of cover logs and sweet autumn wisteria. Some of the tree frogs migrate to the pond in the evening and begin their calling from this clump so it is being used as intended. And yes, I deposit the filamentous algae onto the fence upon removal from the pond where is dries a light brown and remains for months. Why? I don’t know….why not? The frogs are here consistently this year; I’ve spotted toads and the same Cope’s gray tree frog as I had hatch last year. There are a variety of tadpoles now (both in size and in species) as well as fresh deposits of eggs appearing on most mornings. So overall I rank the “good news” as winning the day; I’ll try and deal with the sedges and be satisfied for now. If it helps it looks in your picutres to me as though you are winning. ha. Maybe, maybe not. Regardless, it is a siege…. It’s hard for me to feel sorry for you as you’re being invaded by unwanted plants when it all looks so pretty! Very nice. I couldn’t tell, do you have fish? I wanted it to be as friendly as possible to amphibians (my growing local population of slug, snail and bug eaters if all continues to progress…..) and dragonflies. 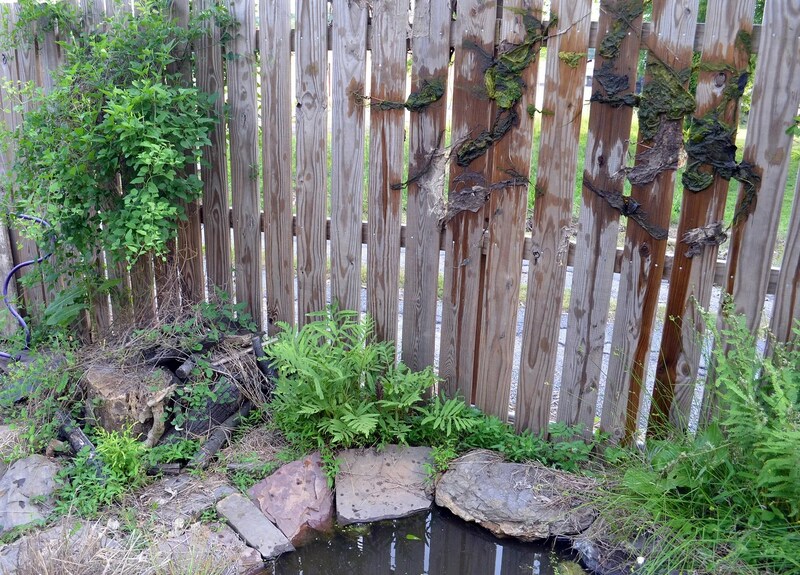 No mosquito problems; the skeeter eaters keep the pond cleared. Diving beetles, water striders and dragonfly nymphs are on continuous alert for their next victims. 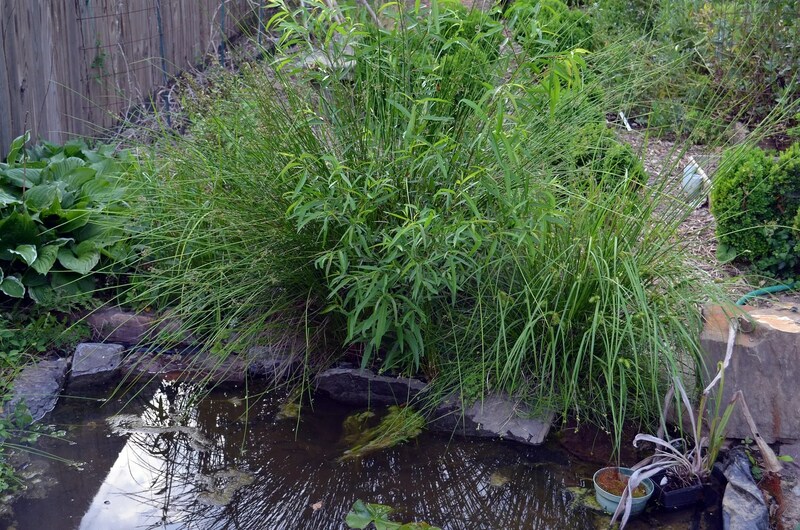 However, if nature brings me fish, I’ll let them stay, since nature brought everything else…..
nobody needs crabgrass. Even I wouldn’t do that to NYC…. You forgot to mention that beautiful water lily flower…or did I just miss that bit. It all looks fab.